The Grapevine Cutting – Helping the Retired and Disabled. You never quite know how an idea came about, especially one that you have been using for over 20 years. The idea of adding a vine cutting to each bottle of Spencer Hill and Latitude 41 was the easy part. The problem was how to attach the cutting to the bottle. Someone suggested raffia and we finally sorted out how to tie it all together. When we calculated that we could use up to 180,000 cuttings per year….the challenge was beginning. The easiest way was to put them on the bottle at the bottling line. That meant they had to fit over various closure and sit properly on the bottle neck. Had no idea who would have the patience to make that many and at what cost? After talking to a number of organizations it was suggested that this would be a good project for those people that retired or disabled. We talked to various support groups and it was suggested that it could provide a feeling of self worth as well as provide some extra income for many of these folks. For many years we had a number of different people making these cuttings for us. They are tied onto a stick, removed after tying, and placed loosely in boxes. We then place them on the bottles just prior to packing the cases.They provide the bottle with a very distinguishable look and one that people remember. Small Batch Winemaking – A Very Different Way to Make Pinot Noir. We make our Pinot Noir quite differently than most winemakers. We ferment in one ton plastic ferment bags that are fully enclosed. The bags are placed into a fiberglass container. The grapes are crushed into the bag and a tube within a tube is placed part way into the bag. The outside tube allows gas to escape and the inside tube allows the wine to flow upwards and over the skins. This allows for very gentle extraction without plunging. The bags heat up during fermentation to about 33C resulting in soft tannin extraction with amazing color. 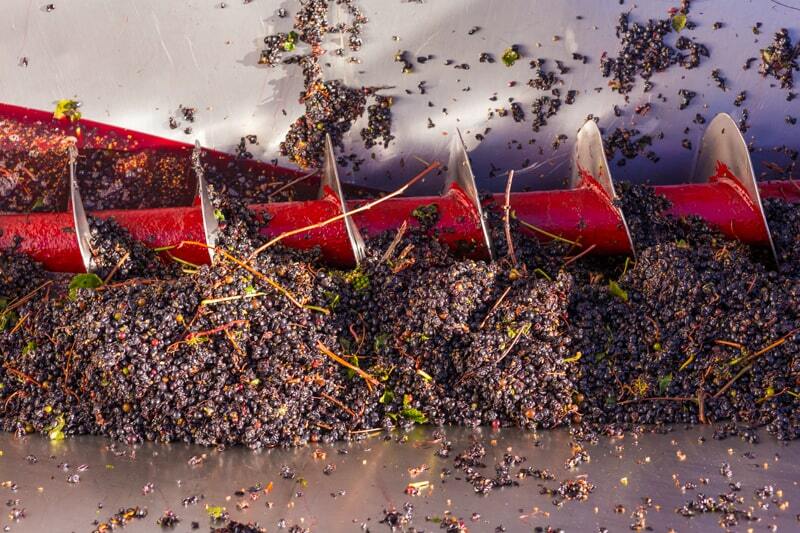 Once ferment is complete the wine in the bag is removed and the skins placed into the press for a gentle pressing. We always combine the free run and pressing because of the soft extraction . The ferments are conducted in one tonne batches so we have the opportunity to look at each batch, choose the best and work out the best blends….always saving the best for our Reserve wine.